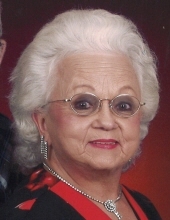 Bertha L. Deal, age 89 of Roopville, Georgia passed away March 28, 2019. She was born July 25, 1929 in Bakersfield, California, daughter of the late James Davis and Melinda Horton Davis. She was a member of WMU and loyal order of Eastern Star. She was a homemaker and also a member of Lebanon Baptist Church. In addition to her parents, she is preceded in death by her husband, Charles T. Deal; son, Joey Deal; and brother, James C. Davis. Survivors include her children, Travis and Brenda Deal of Milledgeville, Linda and Kenneth Smith of Monticello, and Tenny M. Burnett of Roopville; seven grandchildren, ten great grandchildren, and a host of nieces and nephews. Funeral service will be conducted Saturday, March 30, 2019 at 2:00 PM from Martin & Hightower Heritage Chapel. Interment will follow in Carroll Memory Gardens. The family will receive friends at the funeral home Saturday, March 30, 2019 from 12 PM until 2 PM at the funeral home. Messages of condolences can be sent to the family at www.martin-hightower.com . To send flowers or a remembrance gift to the family of Bertha L. Deal, please visit our Tribute Store. "Email Address" would like to share the life celebration of Bertha L. Deal. Click on the "link" to go to share a favorite memory or leave a condolence message for the family.